US biocides demand will rise 3.7 percent per year to $4.1 billion in 2020. The energy market, a key contributor to demand gains during the past decade, is expected to lessen due to a slowdown in oil and gas drilling. In other markets -- such as food and beverages and cosmetics and toiletries -- consumer preferences for “clean label” goods will fuel shifts in biocides usage. 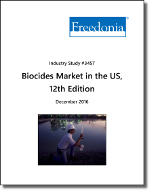 This study analyzes the $3.4 billion US biocide industry, with forecasts for 2018 and 2023 by product (halogen compounds, metal-based compounds, organosulfurs, nitrogen compounds, phenolic compounds, organic acids, glutaraldehyde, other), application (preservative and additive, water treatment, processing) and market (industrial, consumer and commercial, energy). The study also assesses company market share and lists industry players including Dow Chemical, Ecolab, LANXESS, Lonza Group, and Occidental Petroleum Group (OxyChem).